Our supermarket announced another Lobster sale, 1-1/4 to 1-1/2 lbs at $5.88 a pound. That was enough to get us out of our seats. We had the fishmonger steam and crack three of them so they were ready to go. To Cathie, nothing is more of a treat than simply steamed with a dipping dish of clarified butter. For me the dipping dish was a combination of Mayonnaise, Cocktail Sauce and Lemon Juice. Somewhat like a simplified Russian Dressing. 1. Humanely kill the Lobsters by plunging a chef’s knife into the head. It immediately dies. 2.To steam the Lobsters, fill pot so that water comes up sides about two inches. Add 1 TB of salt. Bring the water to a boil, & put in the Lobster. (Feel free to use a steaming rack or just add directly to the pot.) Regulate the heat if the froth starts to bubble over. Cover the pot tightly & start counting the time. The Lobster is cooked after 12 or 13 minutes. 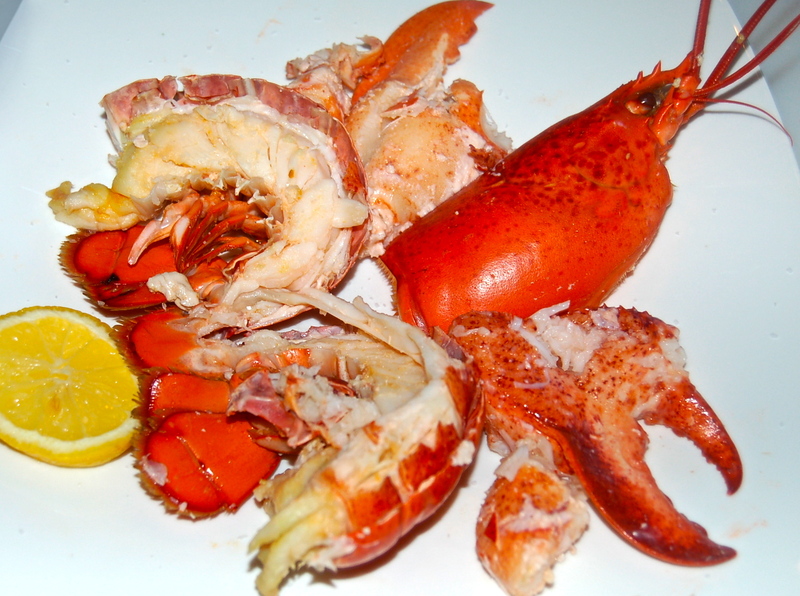 3 .The Lobsters are done when the outer shell is bright red & the meat is white, not opaque. Do not overcook nor undercook them. 4. Carefully remove them from the pot with tongs, they are very hot. Note: your Lobster will continue to cook a little after you take it out of the pot. To stop the cooking process, place the steamed lobster in a bowl of ice before cracking. 6. Plate & serve with a wedge of lemon & a dipping sauce.